The other morning I read an interesting essay by William H. Weitzer in Inside Higher Ed that explored the campus as a “place”, and extolled some of the benefits real campuses offered over online education. The essay went on to suggest that these “places” and their associated experiences should be exploited when recruiting students, especially since they are absent in the online equivalent. Apparently colleges and universities are beginning to feel pressure from the third fastest growing industry in America, for-profit universities, where the majority of the educational experience occurs online. And then later in the week I read another IHE piece about the importance of place, this time by Scott McLemee and concerning the New York Public Library’s plan to move about 1.5 million books out of the main library and to a storage facility in New Jersey. The reason the library has given for the move is to make room for people working on their computers. It seems there have been a lot of discussions about “place” these days, and in our business, the focus has been on the disappearance of places that sell books. Last year the Borders chain folded, closing 800 bookstores and removing millions of books from our communities, and so far this year not a week has gone by without the announcement that an indie that’s been around for over a decade is either closing or up for sale. Important stores like R.J. Julia and University Press Books are both looking for new owners, and if new owners aren’t found, University Press Books is likely to close. The downward spiral of the bookstore in America seems to be increasing in speed. With ebooks, pirating, and predatory online booksellers, it seems only an idiot would suggest bookstores even have a future. Well, my friends, that is precisely what this idiot is about to propose. It seems clear at this point that the relationship that publishers have with indies has to change. Last year, right before Christmas, Amazon urged customers to go to brick and mortar stores and compare the physical store prices to Amazon’s prices. Amazon even paid people for reporting those store prices back to Amazon. 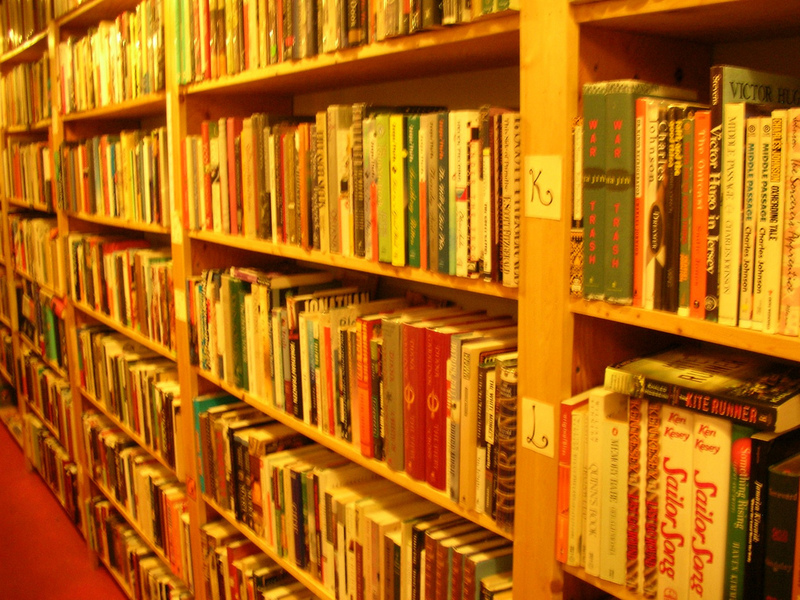 Bookstores called the practice “Showrooming” and noted the inherent unfairness in providing an important service for the book community without receiving the actual sustaining sale. But it got me thinking. With bookstores closing and libraries cutting staff, hours, and even the number of books actually in a library, perhaps a new approach is in order. Maybe if we can’t beat them, we ought to join them. Imagine you’re walking downtown and you see a sign for a new business, THAT BOOK PLACE. Cool, you think to yourself, an idiot with money they apparently don’t need has opened a new bookstore in my community. I’m going to go check that out before it goes out of business. So you cross the street and walk in. In front is what you might expect, big stacks of The Hunger Games trilogy, a book of erotica for moms that appears to have something to do with the Pantone variations between PMS 400 and PMS 450, and a new cookbook teaching the virtues of artisanal water boiling. After venturing a little farther into the store you come across a machine that looks like a copier. The only reason you’re pretty sure it isn’t a copier is because of the Plexiglas chamber in the middle with robot parts that seem to be making something. At first you’re a bit excited and hope that it’s one of those Mold-a-Ramas you remember from childhood visits to the natural history museum and that a warm, wax dinosaur will pop out of the chute. But no, instead a warm Stephen King paperback pops out. And as you look closer at the Plexiglas chamber you see that the machinery inside is making books, paperback books, one at a time. Curious, you go to the counter and ask about the machine. Cool, you think to yourself, as you head into the stacks. I’ve been meaning to get a copy of Lea’s History of the Inquisition of the Middle Ages. I’ll have them crank one out before I leave. Confused about this, you head back to the counter to ask what it’s all about. “How much is membership?” you ask. “Well, what kind of file is it?” you ask. “You get both a PDF and an ePub file,” replies the clerk. So maybe publishers should treat indies like showrooms, and send their books to indies on consignment. That means that only if and when a book sells is money paid to the publisher. The books in the store shouldn’t be the focus of the revenue. Instead, the revenue might come from membership fees, book rentals, and referral fees for drop shipped new copies or ebook sales. Members of this store/library then would have a stake in keeping the store/library open, so presumably they would have little motivation to misuse ebook files. Then I as a publisher might have a reason to trust the store and those members with DRM free files. I would offer DRM free files in a store like that, where there is a relationship between the file and the store and the customer/patron. We are all shareholders in that scenario. I think other publishers might consider offering DRM free files in such a scenario too, but perhaps I’m too pie in the sky. If your local bookstore/library depended on the revenue ebook sales and rentals generated, you would have a stake in that revenue. I would hope that that could be an environment where publishers might be willing experiment with trust. But then again, I’ve been known to believe in lost causes before, and have been absolutely wrong. So if I were to open a new store today, that’s the model I’d try to sell to publishers. Treat me like a community library/showroom, whose mission is both dissemination and access, and book ownership, maybe even a non-profit. For a publishing community like ours that has a similar mission, this might be very fruitful. But it would depend a lot on the store, and particularly where it was. Which “place” are we talking about? This brings me back to University Press Books. No, not our product, instead the store in Berkeley, California. I have been in conversation with the owner, William McClung, and I shared some of these ideas. He’s willing to experiment. We also discussed practical ways we might transition to such a model and one thing we both decided had to be the first step was books had to be sent on consignment. If the point is to display the books, why would we charge the store for the display copies? You might ask why we would want to display our books there. Why wouldn’t we? Just between Stanford and UC Berkeley there is an enormous audience of scholars I want to look at our books. It’s like a year round conference where scholars are continually visiting. This is not to say they shouldn’t be allowed to sell that display copy, but if they do, they will probably have to sell it below the retail price, as it won’t be in pristine condition. So, we ought to consider allowing them to set the price of the display copy. Yes, if it does sell, we’ll still get the majority of the revenue, but it will be based on a price that the store sets. I also told them that I would pay them a commission on anything they sold using that display copy. And I promised that I would pay to drop ship a brand new book to a customer, if the customer preferred that to getting it at the store. So, I’ve put my money where my mouth is and I’ve sent them 200 of our books, on consignment, and I’m giving them the flexibility to price those books. When our business manager asked how we would know what they sold it for, I told her we would trust them. And I pointed out that if we can trust POD and ebook platforms selling our content when we really have no way of knowing how much they’ve really sold, I think I can trust a bookseller. Another advantage to this approach is since they are display copies, I don’t have to send still-in-the-shrink-wrap copies. I can send slightly damaged copies, or left over exhibit copies. The important thing however is my books are now in front of one of the largest academic audiences in the country. With that in mind the books I chose weren’t necessarily all of our latest titles. Instead, I was sure to include all of our perennial adoption titles, some of our best sellers (non-regional, of course) and some of our most impressive new books. I also did a search of our author database and was sure to include all of the authors who live in the vicinity, though they also typically taught at UC or Stanford. It’s at this point in the post that I make the pitch. Unless something really radical happens, University Press Books is going to close. Would you consider doing what I’m suggesting? The McClungs think that this model has the potential to keep them open. Simply moving to a consignment basis makes a major difference in cash flow for them. Will you consider doing the same? I’m not asking anyone to sell DRM free files, or to allow their titles to be rented, at least not yet, but I am challenging our community to do something, anything, to keep that store open. Would you consider sending books you’ve chosen to University Press Books on a consignment basis? If this works in Berkeley, perhaps it’s a model that could also help St. Mark’s at NYU, or any of a number of bookstores that specialize in our books. Please consider this. And if you’re not convinced it’s worth trying, consider the alternative—one less book place—one less university press book place. Then this would be like Book of the Month Club in a physical setting? With the advent of Expresso Book Machines,I’ve wondered why this idea hasn’t been tried. And I agree that exhibit copies can be used. Good for you! In and Academic Setting the possibilities are endless. Please post the progress of this experiment. I’d bet it’ll be a success. Interesting idea in here….wonder if anyone would actually venture to try it! Actually, publishers already provide books to bookstores for free. Any unsold stock (for the majority of publishers) is returnable for full credit, which can then be applied toward the purchase of new titles. Publishers also provide actual funds in the form of payment for preferred placement and other cooperative activities. Bookstores fail because they have never really had to rely on sales as their main source of revenue. The flaw in this model is clear—if you depend on support from publishers to survive, and publishers cut the level of their support (and the landlord raises the rent and the cost of utilities rises…), you’re screwed. This, in my opinion, is why the Espresso Book Machine is the future of bookselling. Booksellers can still have shelves of hardcovers for those who want them, but by having titles available for immediate printing they can do exactly what they all say is now impossible—compete with Amazon’s immense catalog. Publishers will no longer take a huge loss if a title tanks and thousands of books come flooding back. All that’s preventing it from happening is inertia. Luxury and Book Places | all these birds with teeth: this is not about science. Thanks for finally writing about >Book Places in the Digital Age | The Digital Digest <Liked it!